Finally—finally!—it looks like the U.S. has gotten through the worst of this winter’s record-breaking flu season, according to the Centers for Disease Control and Prevention. But there’s still a bit longer to go before we can get the all-clear. The latest surveillance data from the CDC, released Thursday, indicates that rates of flu-related cases, hospitalizations, and deaths are leveling off. During the week of February 10 to 17, 6.4 percent of visits to a doctor were prompted by flu-like symptoms—a drop from the high of 7.4 percent seen the week before. The proportion of reported deaths caused by flu and pneumonia dropped as well, but still hovers around 9.5 percent of all deaths reported to the CDC. And while flu remains widespread across 48 states and Puerto Rico, the level of flu activity has been downgraded from high in 11 states, with three states—Maine, Montana and North Dakota—now reporting minimal activity. The CDC isn’t officially declaring that the flu season has reached its peak either. That will take a few more weeks of waiting and watching. And plenty of those most vulnerable are still dying. There were 13 pediatric flu-related deaths reported last week, bringing the current tally up to 97 for this season. The total count is expected to eventually eclipse the 148 pediatric deaths reported during the 2014-2015 season, which was previously the most severe season seen in recent years. Typically, flu seasons last around 16 weeks. But while we’re now in week 14, the CDC expects that this season will go on longer than usual. As such, they’re still recommending that people, if they haven’t already, get a flu shot, which takes around two weeks to provide full protection. 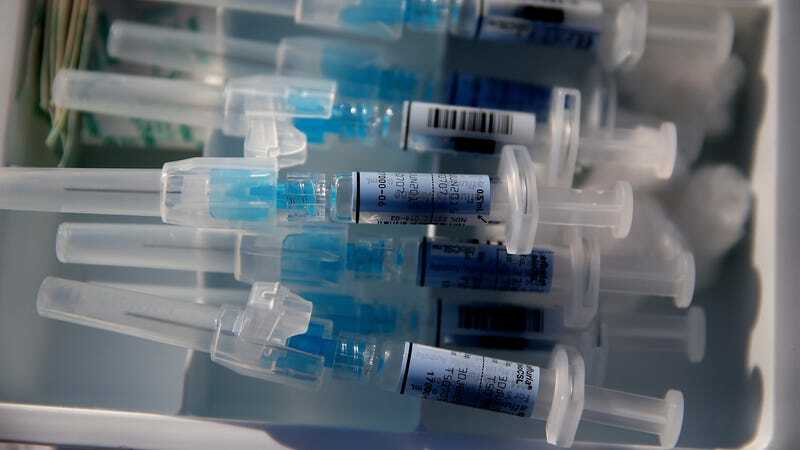 Early evidence indicates that this year’s vaccine has been 36 percent effective at preventing the flu overall, and 25 percent effective against H2N3, the predominant strain this season. But it’s been doubly effective at preventing flu in young children, as well as at preventing flu caused by the other major strains around. While we don’t yet have any concrete evidence on how many deaths or illnesses the vaccine has prevented this year, we do know the majority of pediatric deaths have occurred among children who were unvaccinated.